Just Ask Jack — Tools for the New Commuter? BikeCommuters.com > Advanced Commuter Tips > Just Ask Jack — Tools for the New Commuter? Great question! While there are plenty of seasoned bike commuters who carry extensive toolkits, it is really only necessary to have a small selection of tools to conquer the most common breakdowns. My “bare minimum” essential kit consists of the following: one spare tube, one minipump (or CO2 inflator), one packet of glueless “speed patches”, one 1$ bill, two tire levers and a multitool, plus a seatbag or similar to carry this kit in. 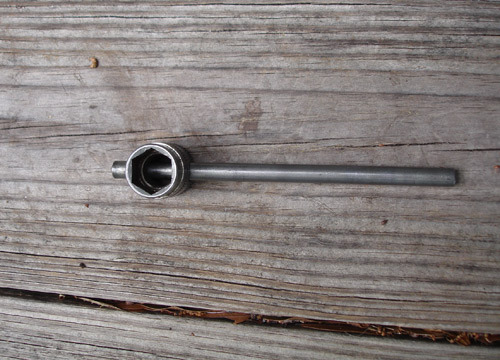 If your bike has nutted axles rather than quick release skewers, it is necessary to include a wrench of some type to loosen and tighten those nuts. Surly makes a great tool for 15mm axle nuts, as does Paragon Machine Works. 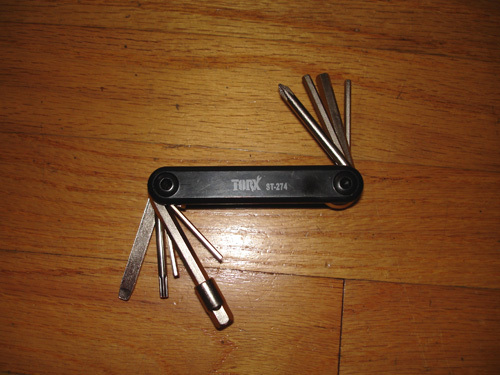 I like this tool so much that I have three of them…one in my backpack, one in my seatbag and one that I occasionally wear around my neck as jewelry! I know, I know…I’m a bike geek; what can I say? What makes the Park tool so special is that it has all the basics rolled into one tool — no moving parts, no “fluff” — 3, 4, 5, 6 and 8mm hex keys (all the common sizes used on bikes), 8, 9 and 10mm sockets (for brake and derailleur cable pinch bolts and a lot of other applications) and a flat-bladed screwdriver for derailleur and brake screw adjusting. Pure genius! This tool was provided by our team sponsor PricePoint. I haven’t used it yet, though, as it lacks the most important hex key size…a 5mm. Perhaps this was an assembly oversight? In any case, these are the only tools a commuter really needs to tackle the most common roadside repairs — flat tires, loose assemblies, shifter and brake adjustments and the like. You could carry more, but you don’t have to! Oops, I neglected to add this: what is the dollar bill for? Well, it makes a great emergency tire boot if your tire’s sidewall gets cut or torn. Just slip the bill between the tire and tube and reinflate. An empty Powerbar wrapper works well, too. Don’t forget to add deodorant! That’s a tool that every commuter needs. Ya never know if you show up stinky at work! First time I see that Park MT-1 tool, gotta stock up on those! I’m always misplacing my bulky multi-tool set. the minute you come up with a design like that, let me know at ghostrider (at) bikecommuters (dot)com. I will totally be your first customer!!!! Moe, that MT-1 has been on the market for a few years…it is worth its weight in gold. Just long enough to snug up bolts, but not too long that you might overtorque a bolt. Sheer beauty!!! By the way, I just noticed that on the Velotees.com website, there are pictures of our very own RL and Priscilla Policar! How freakin’ cool is THAT?!? Good selections, Jack. I might add that I carry a pair of latex gloves. I keep them and my tube in a Ziploc bag with a little bit of talcum powder. I have natural colored cork tape on my bikes, and the latex gloves keep the grease off. I carry a first aid kit, too, but that’s a carryover from medic training. It’s come in handy too—-I was first on the scene when a senior citizen had a car accident. My latex gloves and gauze kept him from bleeding all over the place, but it’s really intended for me to patch myself up. Sounds like the contents of my seat bag. Although I’ve got a CO2 cartridge and inflator rather than a pump. With my commute, worst case is that I end up taking the bus/train. Or I pick up another cartridge at one of the half dozen bike shops along my route. But the most important “tool” that I think I carry on my bike is probably my lock. Okay, maybe it’s not a tool, but it’s quite important for making you feel better about just stopping in somewhere if you want to get a drink or a snack or just have an errand to run. 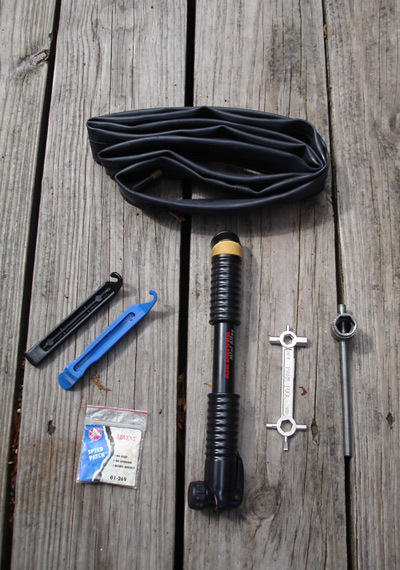 I personally carry two tubes, a Topeak Alien multi-tool, an Einstein Master Blaster Pump and latex gloves. I carry two tubes for the “just in case.” I don’t bother with patches because I can do that at home. It’s easier and faster just to switch the tube on the side of the road, then patch the tire at home. I love the Alien because it has the tools to fix anything. The Master Blaster pump is also awesome. It’s hard to explain how, but this thing is better than any tire lever I have ever used. Two multi tools in case some bolt needs to be held while a nut is turned or vice versa. Also because there always seems to be a few nuts and bolts that the MT-1 with it’s protruberances around the end just won’t reach or turn, same thing with the other, really, just that it’s rare there’s something that both of them can’t work with. Finally, the Ritchey has a chain tool, which I know I would need if I didn’t have. Nexus 8sp comes with 15mm nuts, thus the Jethro Tule. What can I say, I’m a slave to fashion–would have been cheaper get a shorty combo wrench set or hack down a Craftsman wrench. On a previous fixie with trad. threaded headset, I used to carry a Park tool that was a short, portable headset-width (27mm? )/15mm open end combo–lighter than the JT and could be used on pedals, too, but much less fashionable and now I have a 1-1/8 ahead set so the big end would be superfluous. I remember that “shortie” Park headset tool. I believe the big head was 32mm. I don’t really carry any spare parts in my emergency kit. My commute is only 8.5 miles round-trip, so I’m never too far from help. Zipties, duct tape and some extra bolts are definitely a good addition, though — ask Russ about his fender woes! One good thing about being a minimalist, cant break something if its not on your bike, i carry a saddle bag with 1 tube, 1 CO2 and nozzle , 1 Pedros tire lever, and i mini multily tool. Un-conventional tools- bullet-proof tires, ive gone over 1,500 miles without a flat, and chain guides, Talk about Frustration relief, never having your chain fall off! They are small enough that I keep them in the little box that the tire patches come with. However, I advise stuffing some tissue-paper into the box to prevent constant rattling. Alternatively you can mount the presta-to-schrader adapter directly one of your wheels and pop on the schrader cap for good measure. I’d like to add that it never hurts to have some tape with you — not that you’ll need it that much but sometimes cables/wires can get hinky or your handle bar tape gets torn. Anyway, I always wrap about 12 to 18 inches of electrical tape around my spare tube: it’s light, it keeps the tube tightly bound and tape is always handy for those “MacGyver” moments. It looks like the 5mm hex on the folding tool is hidden under the 6mm which will detach easily from the rest of the tool. 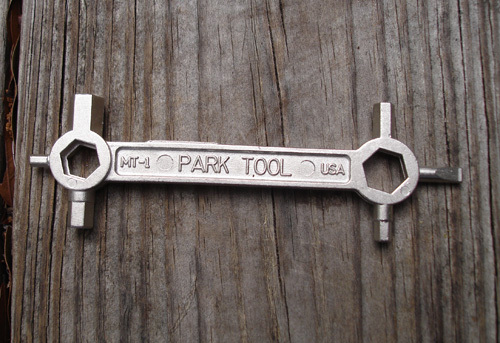 If not I would recommend the Park Tool’s IB-1 which has just what you need for most commuting bikes and doesn’t have the problem of flex in the handle that most small multi-tools have. Though by far the handiest tool any cyclist can have is the knowledge of how their bike works. No, the 5mm hex is definitely missing…that’s my kitchen floor, after all! My favorite remains the Park MT-1 — no moving parts, no flex, plenty of versatility. Ya’ll want to make sure your multitool has a chain breaker for that spare Powerlink! I also keep a small stack of glueless patches & a few squares of sandpaper so I can render assistance to our fellow velocipede operators… who don’t carry tubes. PS: be proactive *before* getting a flat! Install tyre liners (eg: Mr. Tuffy)!